World Clubfoot Day is an annual awareness day observed in June 3. It was established by the Ponseti International Association, a global organization dedicated to training and educating healthcare providers on the treatment for congenital talipes equinovarus, commonly known as clubfoot. Clubfoot is a congenital deformity that involves one foot or both. When it occurs the foot appears to have been rotated internally at the ankle. Clubfoot is a relative common birth defect. It is treatable, and with proper treatment the vast majority of children diagnosed with clubfoot recover completely. The Ponseti method is one of the most widely used treatment approaches, it is becoming the standard in the United States and worldwide. It was developed by Ignacio Ponseti, a Spanish orthopedist. The Ponseti method is a nonsurgical approach that involves repositioning of the affected food and using a series of casts. It is 95+% effective, inexpensive, and has no side effects. 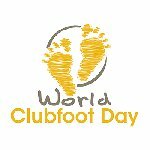 World Clubfoot Day was established to raise awareness of clubfoot and the Ponseti method. It is celebrated on June 3 to mark the birthday of Ignacio Ponseti. World Clubfoot Day events are organized by health care organizations across the world. These events include (but are not limited too) rallies, presentations, social media campaigns, fundraisers etc.